It was my grandfather who, before he took his life, instilled in me a love of adventure and an appreciation for wilderness survival skills. I reflected on those gifts one morning as I climbed the canyon above Unionville while my husband garnered some needed sleep. I had never ascended the canyon before and did not know the area much above the hamlet clumped on the otherwise isolated east end of the West Humboldt Range. My husband and I were camped behind a ridge above that hamlet. We would have bedded further up the canyon but a slender bent alder blocked our Land Rover’s passage. As I prepared to depart camp that morning, my husband admonished me in a groggy voice to take a walkie-talkie, so I grabbed one along with my camera. I inhaled deeply the air chilled by night. Dawn’s gold light seeped over the canyon walls. Ahead of me our two hounds traversed the trail. When the dogs and I passed a tall juniper with plump ghostly-gray berries, it roused a memory of my grandfather. Juniper berries, he had taught me, indicating the wizened ones we had in Maine where I grew up, could be boiled into a tea which aids digestion. But at the age of nine I had a cast iron stomach so I wasn’t motivated to put that knowledge to the test. A small stream bisected our dusty trail, its moisture supporting a patch of spring green grass and a long leafy arbor. I regretted that my husband was missing so much beauty but was grateful that I felt comfortable hiking solo. In my youth, my grandfather’s tutelage emboldened me to set out on my own adventures. Often interspersed with those sojourns were other lessons, sometimes with my younger brother joining in. Grandfather taught us to distinguish the poisonous red snake berry from the minty red bunch berry. And to tap maple trees for sap, which we did while imprinting the snowy paths of his land with tracks of the snowshoes he molded for us by hand. One summer day when we three were together at the Maine shore, grandfather told my brother and me that we could eat the petals of the wild roses mounding over the dunes. I plucked one of the smooth pink wafers, placed it on my tongue, and discovered within it a delicate sweetness. And began to feast. So in the canyon, when I came upon wild roses, the sight delighted me; but when I grew closer, I saw that the petals were waning and could recall that mushy texture tinged with bitterness. A mile or so up the trail I spotted a red shotgun shell. I considered picking it up but for a reason I couldn’t identify, walked on. I could feel it in my pocket though, roll it between my index and middle fingers, remember how I used to wonder how something so itty bitty and weightless could tear such a very sure hole. My grandfather used to lay his shotgun across the wide arms of his oak rocker to clean it, a box of red shells in two perfectly ordered rows by his side. He hunted every deer season and as a result we always had fresh meat. My brother was 16 when he joined the hunts and took to them. He and grandfather, in red wool plaid with solidly shouldered guns, would vanish into the cold pre-dawn void of light. Water is a welcome sight In the desert. 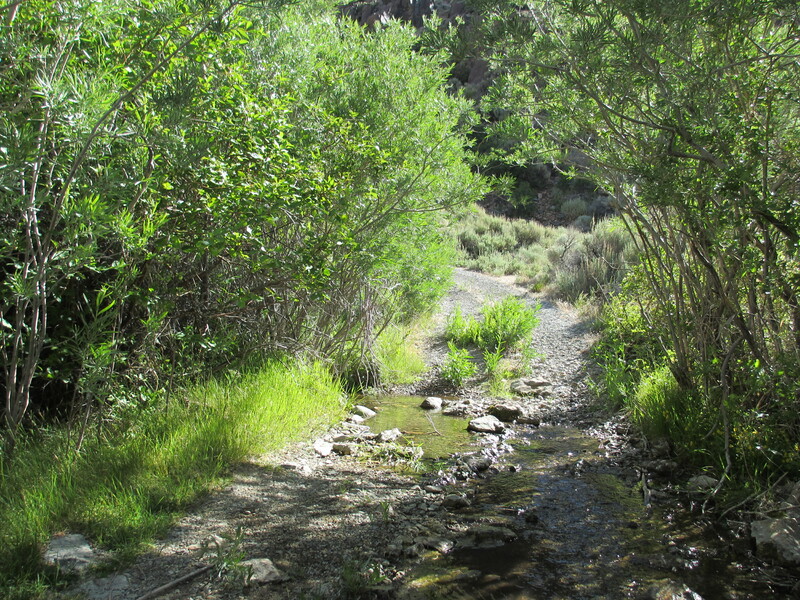 The clear silent stream I had seen at the beginning of my hike wound back over our trail again and again. I paused in the shade of some foliage it supported while the dogs lapped long and slurpily. The sun filtered over the canyon walls and warmed the air. Heightened light inspired me so I took out my camera and wandered a bit, pulled by what I saw through my lens. Continuing up, the incline steepened, forcing me to push from deeper inside. A hairpin turn changed our direction. Then another and another. The pattern persisted for forty-five minutes. Scrub vanished and with it the scent of sage. Jagged rocks protruded from long flat ledges like teeth in an otherwise hollow smile. Then abruptly the trail ended with a sheer 2000-foot drop. I recoiled and grabbed for the dogs. I planted my feet firmly. And stared. There was a time when I would have contemplated jumping. Most memorably, the afternoon of my brother’s suicide, when I stood on an overpass during rush hour, watching the traffic below, imagining the trajectory of my body, removing my pink mohair sweater and feeding it into an opening in the pipe railing. My younger brother. My only brother followed in our grandfather’s footprints, as he had been groomed to do: the berries, the roses, the maples. I sobbed. I raged. I wept. It wasn’t until I grew weary of the pain and turned to faith, that I stopped weeping. Suicide, I finally understood, is and always will be incomprehensible. My brother and I were in our early twenties when my grandfather took his own life rather than seek treatment for prostate cancer. I tried to understand but from the moment I heard the explosion, I was falling, falling, falling. I lost sight of my brother through the hurtling debris that distorted my mind. It was impossible to focus on the petal of a single pink rose. 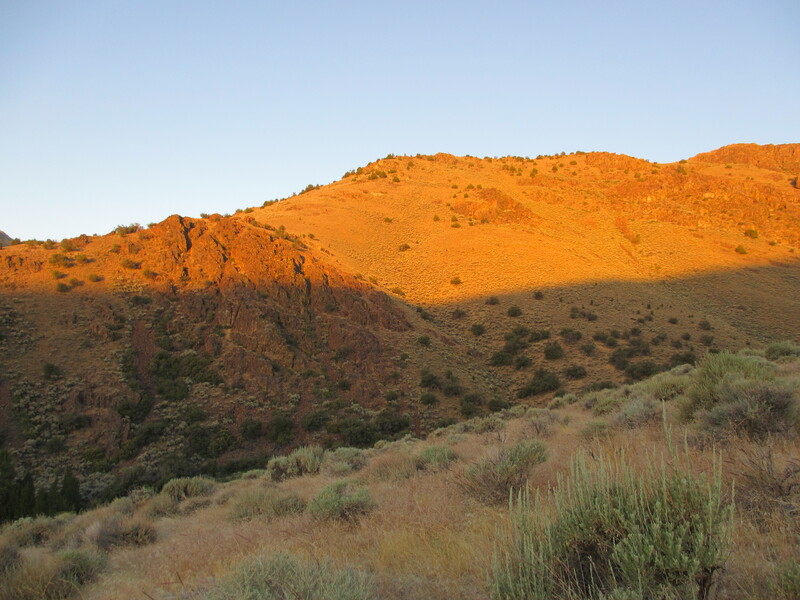 In Unionville Canyon, with the sun risen just above the peaks, I basked in the ambient brightness. And turned with the dogs to begin my descent. Coming down the steepest part, I recognized the spot where I had started taking pictures and realized that there was a fork in the trail that I hadn’t previously seen. Uncertain which way to go, I chose a direction, traveled it for a few hundred yards, turned around, and walked the other way. For a moment fear clouded my mind. I fingered the walkie-talkie in my pocket, knowing I could call my husband–but he could hardly advise me on a route from his position at camp and summoning him would earn me a scolding for having become distracted by my camera. Then I saw the red shotgun shell. One million people die by suicide each year, deeply affecting many millions more. November 17th will mark the 14th Annual International Survivors of Suicide Day. A survivor of suicide is anyone affected by the suicide of a family member, friend, neighbor, classmate, co-worker or other person close to him or her. I am not a health care professional. The experiences described herein are personal. If you are suffering from suicide ideation, please call a suicide hotline and seek immediate professional help. Thank you so much for your comment. It touches me that you appreciated this post. Hi Danna, Thanks so much for your generous comment:) Love and hugs. I admire this narrative. Well done, so very touching. Thank you very much Moriah. It was defintely a challenging piece in terms of narrative. I struggled to “like” this post for reasons to long to list here but those same reasons are the very reasons why I will “like” this post. I am very sorry for your loss but I am thankful you having the faith to share. I am going to re-blog this because , well the reasons are to long to list. Peace be to and yours. Thank you very much for your heartfelt response. I appreciate you taking the time to write to me and I know what you mean about the “like” button–it doesn’t always work when we’re having a more complex response. This was a challenging piece to write both emotionally and in terms of narrative, so it means a lot to me to know that it touched you. I have felt the sting of suicide and know the after taste is vile and hot in the minds of all who this tragedy is visited upon. I hope that anyone who reads this, no matter what side of the divided you are now standing on or have stood upon, will breath in and look for hope. In response to the ending, woaw! I was reading a quote yesterday that says “Sometime you find yourself in the middle of nowhere. And sometimes, in the middle of nowhere you find yourself”. I was thinking about that quote at one point while reading your story. Wow. Well–you did it. Thank you for sharing your story. I have come by and read this post several times since it was published. And over the last few days, I thought of you often, lulled and drawn into your vividly painted walk one morning through a desert trail which merged seamlessly into the past. I listened carefully to the voice of your words. I am so very sorry to hear of this tragic loss in your life. I am so sorry you had to go through that fall. Thank you for sharing with us so honestly some of life’s journeys into the wilderness. Your voice tells me that you now write and walk from a place of strength. And that you have now found your way back. And what a very good place to be today. That red shotgun shell – what a profound and beautiful closure. One of your finest writing yet. Thank you for your thoughtful response to this story. When I was working on the story I reflected considerably on a piece by a blogger who wrote a tribute to his brother who committed suicide–and on your work. I also reflected on your courage when revealing your breast cancer and on the reticent intensity that you bring to your narratives. It’s always a gift when a friend becomes a teacher and an inspiration. I am so very, very impressed with your strength in God. I can’t even begin to imagine the pain you must have felt inside. I lost my dad to cancer about 8 years ago and saw what he had to go through – I saw the fear in his eyes and can only imagine how scared your grandpa must have been. My heart just breaks for those who have to suffer so much. Thank you for sharing this part of your life! Thank you for such a lovely comment Kimberly. I’m sorry to hear that you lost your Dad to cancer. I also lost my father to cancer and it is definitely a long and sad trial for everyone involved. I am sure my grandfathe was terrified or he would not have chosen this path. We all have our breaking points. By the grace of God, I have found comfort in His love. I hope you have too:) Thank you again for writing:) Have a great day! thank you for sharing your experience with suicide….I attempted once..God chose to save me despite myself….and I have never wanted to do it again….. Your story reminded me of the times I had wanted to die and the divine intervention that clearly changed my life. As always I love your writing, and the photos a delightful too. 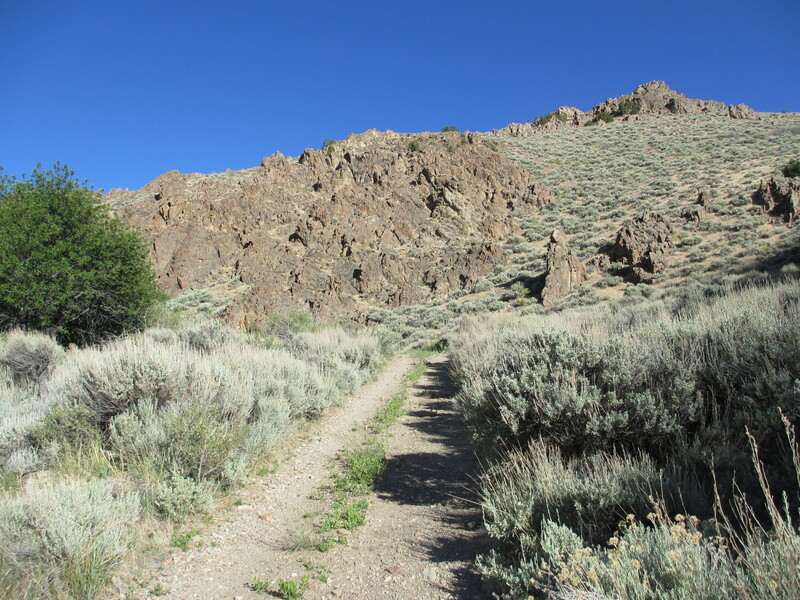 I did find myself wanting to see a photo of the cliff your trail led too. You are so kind to write to me of your experiences with despair and divine intervention. It means a great deal to me to know that this story is meaningful to you and that God has spared you. I wish I could provide you with a photo of that cliff but because I am using a small point and shoot camera, I’m somewhat limited in scope, unless the ligth is just right, which it wasn’t (for the cliff) that morning. I hope to be graduating to a new camera soon. Well, you’re raising an interesting point. First of all, when I say that God has spared you, I am referring to suicide, i.e. if you have wanted to die but have not committed suicide you have been spared the anguish of that act. That being said, I do believe that it is often a form of trial to remain here on this earth, I do believe that in death, we are with God, that God is beautiful and peaceful and loving and more exquisite than anything we can imagine. I never write in this blog about the many experiences I have had that transcend our physical reality but they definitely do shape my perception of death. I’ve always felt, however, that death by suicide is different, not because of a religous stance but because of my experience with these suicides. I don’t know your experience of life or death and I apologize if I was presumptuous when I said that God had spared you. It is purely my perception. Thanks for initiating a lively discussion! Vivian, this is a powerful and moving account from your life. Thank you for the honest sharing and the hope that comes through. I can relate to suicide. I survived by the Grace of God and I am forever Grateful. I have experienced close to my heart someone who committed suicide. I understand what it is. Having FAITH to God is what keeps me alive. I still think about it but it has no hold on me anymore. Thanks for sharing your story. God Bless You. God has helped us through suicide as well. It’s scary to be in that state but even mor so when it’s your children. Thanks so much for your sharing such an honest and poignant account. We all have our own journey. I just read this post.you are so talented in writing and so touching, Vivian. Thank you kindly for visiting and for reading this piece Meg. Funny, I’ve been thinking that I want to begin to give more attention to detail in my blog writing. With this piece I found myself focusing on detail more than in many of the others, because I thought at one point about expanding and submitting it.